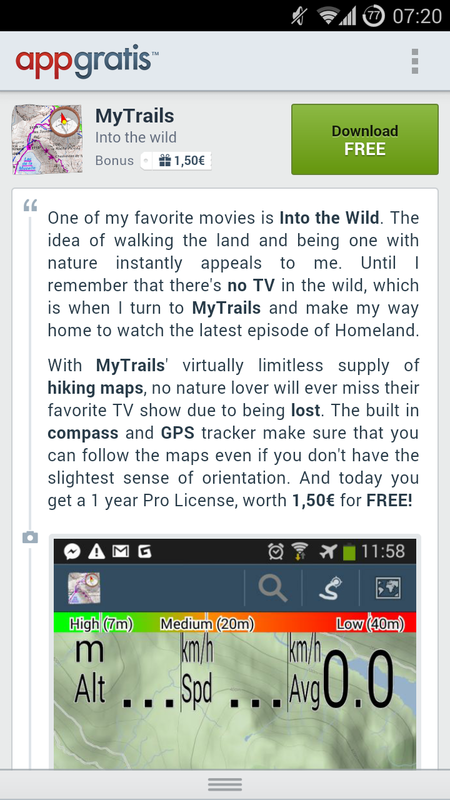 Today (May 16th) MyTrails is AppGratis‘ free app of the day, so installing MyTrails for the first time with the AppGratis application will activate MyTrails Pro for one year (MyTrails has to be run at least once during the promo period). You have to do this before the promo ends (late on May 16th). If you have already used another similar promo for MyTrails, please note they can’t be combined (even if MyTrails accepts the new promo code). Update: the promo has been extended until May 25th to give users who were unable to activate it to do so. This entry was posted in Blog on 16 May 2014 by frogsparks. This entry was posted in Version history on 15 May 2014 by frogsparks.